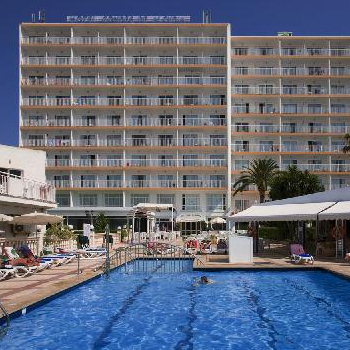 I have never been to Majorca before so was a it apprehensive about it, our stay was relaxed due to the welcome we received from staff, other guests very friendly. Food was excellent although too much salt added to some food, lots of choice . I did get worse ever attacks of Mosquito bites and been poorly since home with them. We were a family of 4, 2 adults 1 child and a baby our room was on the 2nd floor overlooking the pool. This is the noisiest hotel we have ever stayed at. Due to noise from drunks and smokers congregating below our balcony till gone 2am most evenings. Then slamming of doors and screaming and shouting in the halls as they went back to their rooms. We did ask to be moved but were told that the hotel was full and there were no rooms available. On the plus side the location was good and a good selection of food. Rooms were average. Third visit to this hotel and truly disapointed with some aspects this time. The hotel staff are great as is the food and standard of the rooms, very good for a three star hotel. However , given that the price of our holiday had increased by approx. 20% since last year, there were two areas that failed badly. The entertainment was utterly abysmal compared to previous stays; the team merely went through the basics and couldn't wait to finish their tasks making the minimum amount of effort. On the Tuesday there wasn't any entertainment staff at all on duty, apparently this will happen every week. Rumour had it that because the all-inclusive option was proving too costly to the hotel group they had taken the decision to make the entertainment as rubbish as possible to persuade people to leave the hotel to seek it elsewhere thus saving them money on both the hiring of acts and on the bar bill. I feel for the hotel staff as they genuinely try to do their best. The complete experience of staying at the Condes was way above my expectations for a 3 star hotel. We stayed half board, the choice and quality of the food exceptional. The entertainment team were hard working and also very talented entertainers in their own right. The quest entertainers that appeared once a week were also extremely good. The hotel is ideally situated for the beach, the bars and all other amenities. The entire staff from the cleaners to the bar waitresses were the politest and happiest I have ever encountered. The only things about the hotel which were not quite as good were the very small lifts, the smallish pool with not enough room for the sun beds, and the small rooms with tiny shower cubicle on the street side of the hotel. All in all I would give the hotel 8 out of 10 and would recommend it to anyone. booked this holiday 17/10/09 and travelled on the 20/10/09 and got it for a stupidly low price for 3 of us. staying all inclusive so wasn't expecting much from the hotel how wrong can you be it was fantastic. the condes was very clean. the room was cleaned every day and fresh towels everyday also. the room was on the small side but as we only us it to wash and sleep this wasn't a problem. we had a view of the pool. the pool wasn't very big and was to cold to swim in but in high season i imagine it gets very crowded. the food was lovely definitely the best 3* i have eaten in, my hubby said the food was nice and he is very hard to please. there was a cooked breakfast, cereals,pastries and continental breakfast,jams and lots of fruit. lunch and dinner was choices of hot meats,fish,stews,salads lots of vegetables,soup and desserts and all of good quality. the hotel was only a couple of minutes walk from beach,shops,bars and restaurants. the hotel staff were very nice and helpful wasn't keen on evening entertainment to cheesy watched once or twice but preferred to go out of a evening to have a walk and visit local bars. even though the food was really good we like to try a few of the resorts restaurants while on holiday all of which were excellent. Really well run hotel. Rooms are smallish and modestly furnished but more than adequate. Comfy beds and pillows and the housekeeping was impecable. Six fresh towels every day, bedding changed every three days, bathroom and bedroom kept spotless. It's in a great location, 2 minutes to the beach and a comfortable 15 minute walk into the old town of Alcudia (fantastic). We were all inclusive but there's plenty of nightlife within easy reach. Generally the restaurant and bar staff were great, only one guy was a bit 'disinterested', slopping half full glasses of drink towards you. The entertainment staff (only two of them while we were there) Sarah and Wayne work long hours and always have a smile and a friendly greeting. The entertainment was the in-houseduo putting on singing shows 4 nights a week but this got a bit repetative. Three nights a week there were performers from outside the hotel eg ABBA tribute band (great), Robbie Williams tribute (poor), Balancing troup (great) etc. Overall not too bad. The only negative for us, was the pool area. The pool was way too small for the size of the hotel. I reckon about half of the guests when we were there were beach lovers (particularly the half board people), fortunately, otherwise there would be no places around the pool. Apart from the pool, I would recommend this hotel, so if the beach is your preference, this is an ideal place to stay. we went to the condesds de alcudia for 1 week at the end of june begining of july 2009, after a long journey on arrival to the hotel we were delt with promptly by the reception staff and given the key to our room. me and my fiances had a room togtehr and his mum and her hubby and their grandaughter had a room together. we had a room on the 5th floor facig the mountings (would have preferd a pool view but this one was just fine) their was also a road aswell but it was quiet, we could here the birds singing in the morning as i think they have some birds in the hotel gardens across the way, it was quiye nice to wake up to the singing birds and some would make like wolf whistle sounds and we had a bit of a laugh about this, at firsat i thought someone was whistling at us when we went onto the balcony but then realised it was the birds! lol. the rooms was small but was big enough for what we needed to do in it, sleep, get ready to go out and shower. it was clean, we had a bathroom with a bath in it, i think this may have been biger than the ones with a shower in from the previous reviews ive read but ive not seen one of these rooms. we didnt have any problems with the bathroom or bedroom. maids came everyday to change towles and tidy round. the lifts are small and there is a sign saying it can only hold 4 people and when you get in the lift there is a weight indicator which lights up to show how full it is. i saw that one of the lifts had broken down whilst we were there but it was quickly fixed and working again, although i was a little scared of it braeking down on me after seeing that so i tended to take the stairs for most of the rest of the time! although the rest of the family happily took the lift. the entertainment was good, and the team really do put an effort into giving you a good show, there was nightly bingo to play for a coup,e of euros a ticket and a chance to win a decent amount of money. they also had a raffle darw called high five i think and the winner has to go up to the stage and pick a ticket off a board and see if they have won the jackpot, if it is not won then it rolls over to the next night and there will be less tickets for the next winner to pick from, so more chance to win! then there is the nghlty show which is one for 1 hour, and is something different each night, sometimes its the reps and sometimes they have acts from outside on. there were things like an abba tribute, lots of singing, themed shows like summer holiday which will be a story told through song like of different destinations and things, bit like a musical. there was a stunt act with balancing pots on their head and swards and things (outside act), there was a show called saturday night fever and lots more. they get you singing along and clapping hands if you like too. abit earliwer on in the night at about 7-8 they had childrens entertainment, we tended to go for or evening meal at about 8-8.30 so didnt see much of this but what i did see was the reps had the children up on the stage dancing to songs like the music man etc they seemed to enjoy it,they also did some of the childrens diplomas then aswell (i think maybe the younger ones or maybe ones who were their and then the rest later on with the adults) not sure what eles they do at this time though. also at night time the diploma cirtificates are presented just before the bingo i think, these are given to people who have won the games from the daytime, for adults and children and when you have won 5 games you get a gold medal! which our neice got (who is 9) and she was very impressed! and if you win 10 games you get another one. the daytime activties were goodand lots of people joined in, they had things like skittles (bowling) shuffle board, archery, crazy golf (i joijed in on golf and the lifegaurd came and soaked us all with the hose pipe during the game! stating it was CRAZY golf lol that was funny! and resulted in my fiance, his step dad and a caouple of others running after the lifegaurd later on and throwing him in the pool! that was great. of cause the lifegaurd got his own back and threw then in the pool one by one! this continued the next few days if an oppertunity arose the person was in the pool! and the lifegaurd ended up in the pool quite a few times too lol) another game was water polo and the team who got the lifegaurd in the pool or wet (he was sitting just by the side) got an extra point! well i wasnt impressed as i was on the losing team! :-( lol it was great fun! but dont worry if its obvious you just want to sunbath then you wont get botherd, they will come and ask if you would like to join in the games and if you say no thanks there is absolutly no presser to jon in and the lfiegaurd wont bother you either!, i joined in some but moslty just sunbathed. it was a good atmosphere around the pool, all the staff were friendly and everyone loved the lifegaurd , ploting to get him into the pool and been soaked with the hose! nice and refreshing! a good laugh. whilst we were there my fiance went and cut his foot on a tiney bit of glass between he cracks in floor (coult only happen to him!) it was the 2nd day i think, the lifegaurd came rushing out with a first aid kit and looked after him well, he cleaned it up all sterile etc was with him for quite a while cleaning it (it was a small cut on his heel, it was a little bit deep but no stiches or anything were needed)then they had one of the cleaners come out and cleaned the whole area up, very throughru. towards the end of the hilday our niece also got a bee sting and he was there again looking after her, she was fine after a few tears. also there was a mix up with the booking we shouldnt have been goin to this hotel the travel agent got the hotels mixed up (booked over the phone) as there is another with a very simlar name, she told my fianes parents they were going to that one, it wasnt untill we booked to go along with them that it was noticed it was wrong and they were booked into the condess, so we booked for here aswell. the pool was houge lagoon style at the other hotel, so i was a bit disapointed when i saw on the pictures this pool, but i needent have worried and it was fine and i bet they didnt have the lifegaurd playing about at the other hotel! there is a little small padling pool for small toddlers to play in then there is the big pool for everyone, it also has a little section to it for older children too. there is plenty of sunbeds to go around too, infact they didnt all get used up when we were there, they pile them up in stacks and you help your self to them and position them where you want them, the only time we had a bit of a problem was when we didnt go down till abit later about 9.30 and some had gotten in our usual space, but there was still enough space to put in our beds at the side of theirs so it was ok anyway! and there was other space to put it if we couldnt have got there. the sunbeds i thought were quite comfy too! the beach is a 2 minuet walk away and is lovley, the best beach ive seen up to now and ive been a few places, cyprus (whcih had a lovley beach too but alcudia had nearly white sand) crete, corfu, tenerife, egypt. the sea is clear and is shallow quite far out and flat so safe for children to play. sunbads were 9 euros i think for 2 beds and an umbrella for the day, but you could also just put your towle down on the sand too and not pay for a bed, lots of people were doing this. there are lots of shops and restraunts close by, i think there were a few bars but think you would need to walk into alcudia centre which would take about 20-30 minuets if you wanted more of a night out. we attmepted to do this one night someone gave us directions, go to the bottom of the street like your going to the beach then turn right, its a straight road but we stopped too soon where we thought was the town as we wanted to get back for the fireworks they were having for saint peters day i think it was. we found on the coach drive back to the airport that we hadnt walked far enough as there were lots of bars, restaunts and shops in a little centre and close to the the beach, it looked like it would be quite livley at night. me and my fiance decided we wanted to eat out one night and thought we would get a taxi into alcudia town, we asked to be taken the the town centre and he took us to what i think was alcudia old town, we were expecting to go to the main town where all the bars were! oh well, we had a walk around and there were some shops and mainly restraunts it was very nice with cobbled streets and a church that type of thing. we chose a restraunt to eat at which was lovley of a little expensive (altohuh we do like to have a starter and a main when in holiday, maybe if you just had a main or a 2 or 3 course as one offs then it might not be so bad? ), it came to 45 euro wuth a tip for 2, we shared a starter and had a main each, i had a glass of wine and my fiance a beer. my fiance had pizza which he said was a little geasy but my lamb was lovley. not sure if this is a more expensive area as we looked at some of the prices of the other restraunts (in the old town and around where we stayed) looked and they all seemed about the same, we were told it would be cheaper at aludia center, im assuming this would have been the one wehre all the bars are that we passed on the coach. there were a couple of cheaper retraunts near where we were staying, some had deals on like children eat free, set menus etc. there is a nice harbor just down the road from thehotel too with some trestraunts alon it id imagine that woul be nice for a meal at night, there were also some restraunts on the beach. lunch was chips, boiled potatoes, vegs, meats, a diff type of fish each day, burgrs, hot dogs, pasta, jacket poatoes, cold meats, bread, soup, salad, rice and some others i cant remember it changed each day. and a varity of ouddings too and ice cream. the drinks were ok too, they had a beer machine to help yourself too and a wine with white, rose and red wine and a soft drinks machine with fanta, coke etc to help yourself at breki they had a pure juice machine too (these are all inclusive only) and and a water dispenser too. drinks from the bar were good, they had vodka, gin,peach snaps, beer, wine, they had a machine with 2 alcoholic cocktails in- pina colda and 'love' on the beach and also a non alcoholic cocktail too. and all the usual soft drinks fanta lemon, coke, water etc. they had a cocktail bar but i think you had to pay for these i think it may have been half price for all inclusive guests, i was going to have one one night but didnt end up having one. cant really think of anything eles to say, this was a good hotel and we had a good time there and it is close to the beach and shops and restraunts. Just come back from staying in the Hotel Condes de Alcudia for 1 week all inclusive. The Food For breakfast there was a full english with a tea coffee milk and fruit juice machine.The watiers and waitresses were friendly enough.For lunch there was avariety of different foods such as:Burgers,Sausages,Salad,New Potato's,Pizza and lots more foods.For dinner there was:Meats,Salad,Rice,FishChips although after a while the chips got a bit repetitive because the had it on offer for lunch and dinner everyday.Also they had a wine beer and soft drinks machine. Pool,Entretainment,Games The hotel had a small toddlers paddiling pool with anoyher pool for everybody.The entertainment in the evenings was FANTASTIC!!!! !Some of the shows was:Karoke,B.O.O.M.S. the kids singing and dancing show,Animal Shows,Acrobatic Shows and every night there was a game of BINGO with a chance to win over 100 euros.During the day there was games ran by the entertainment team who was extremley friendly and funny.These are some of them: Water Polo,Bowling,Bolws,Archey,Shuffleboard and lots more!!! Hotel Rooms I had a family room with my daughter snd husband it contained 1 bunk bed,2 single beds pushed toghther,wadrobe,dressing table and safe.The bathroom was small it contained:A bath with a shower in it, big mirror,sink and toilet.Most of the rooms had balconies except some of the first floor did not have one.There was 9 floors in total.The lifts were small and could only hold 3-4 people in it. After due consideration i would reccomend this hotel to a friend and possibly go back to it in the future.I would rate this hotel 8 out of 10.
party of four,we could find no faults with this hotel the food was great and the staff went out of their way to help you and nothing was a problem to them. This hotel is classed as a 3 star in the brouchure. We would normaly stay in a 4 star,me and my wife only stayed for one week but the other party of two that travelled with us stayed for two weeks. This is one of the best hotels I have stayed in and would recommend this hotel. Being October there were very few children in the hotel. The meals started at 7.30am right through the day until 11.30 pm ....lovely hotel! The hotel is a lovely friendly place, all the staff were polite and helpful at all times. The food was always nice and as was served all day there was no chance of going without. As it was late in the season there was limited amounts to do, a lot of the shops where shut and so where some of the bars around, the hotel still had full entertainment through th e day and night. The only disapointment was with our room, it was very small and basic, the bed was only just bigger than a single so a very tight squeeze for a couple, also the sheets were not big enough for the bed so it was a fight all night to get a bit of cover! not a problem in the summer as you wouldn't be in the room much but as we went late in the season the weather was not that great! Also the phone in the room didn't work when we got there and wasn't fixed even though we reported it. All in all we had an enjoyable holiday here and met lots of nice people, I would recommend it to couples not families as the pool is very small and there was only 5 or 6 children there but it looked crowded with their lilos and things.